Does a plant exist any less if the gardener doesn't remember buying it or planting it, and can not even name it other than to say, "Pretty orange tulips and those look like daffodils with no trumpets". I found two of my bulb receipts from last fall, and I did not find anything on them that resembled these two flowers. But clearly, they do exist, oddly planted on the edge of a new flower bed not yet planted with anything else. No doubt I choose that spot last fall because I could dig there without a pick axe. Oddly enough, there is no pick axe in my garden shed of tools, which number well over --- anyway, I don't have a pick axe. I would plant more of those next fall, if I just knew what they were. (Update, I came home today and skies were overcast. There for me to see was the mystery yellow flower. It is no quiet daff! It is a tulip! Tulipa sylvestris, to be exact. I purchased it from Old House Gardens, planted it, forgot it, but fortunately kept the package. And right there on the package it says "this charming wildflower has small yellow, almond shaped flowers that nod in bud and then open wide in the sun." In my defense, here's how it looks in full sun. But my defense is pretty weak because you can see a bud behind the flower that clearly looks like a tulip bud. But the foliage is narrow so that threw me off. But I was in a hurry, so I didn't look at it closely. OHG continues their description of T. sylvestris: "Gerard pictured it in his great Herbal of 1597, Jefferson grew it at Monticello, and you'll find it naturalized today at the Rochester, N.Y. estate of Victorian nurseryman George Ellwanger as well as through out Pennsylvania Dutch country." Oh, I have many such plants! Chalk it up to bad memory, lousy record keeping, birds, squirrels and pure lovely chance. Have an absolutely gorgeous bleeding heart that I know I didn't plant, which makes it all the more lovely. Cheers to serendipity. I was coveting all the Ice Follies daffs on blogs this spring and planning to get some this fall when I noticed mine starting to bloom...guess I'd already corrected the lack last year. I am jut relieved that it doesn't only happen to me! I have actually started marking where I put plants that are not green all year round so I remember that I have planted something there. I have been know to start digging a hole to plant only to find out there is already something there. I know what happened here.Those garden faeries were up to mischief again. It is so frustrating not to be able to name a plant, especially since one might want to order more. You have pointed out that keeping all those pieces of paper from nursery orders really do serve a purpose. Maybe I should neaten up mine. I have always thought some of those companies just send any old bulb, hoping we forget what we ordered by the time it came up!! I have never seen a totally cupless narcissus. 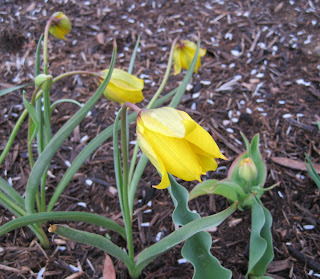 At first glance I thought they were some sort of yellow tulip, but on closer look they don't have tulip foliage. Can't help with the bulb ID, but that trumpet pun was pretty brassy of you! I have lots of "oddly planted" plants, Carol! And I also have a lot of mystery bulbs, too--I think I mixed up new bulbs with old bulbs last fall, and now I'm not sure I know which is which. In the end it doesn't really matter, does it? I think your orange tulips and mystery yellow tulips are pretty even if they have no name. What a coincidence, just yesterday I noticed something yellow blomming in our little woodland, my first thought was the same as yours, a daffodil, but then when I looked closely I could see it was a tulip. 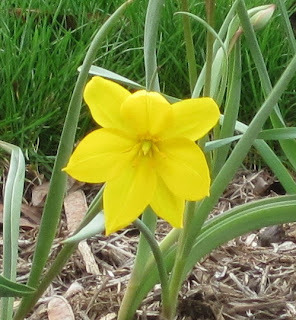 Then I remembered that I had planted some Tulip sylvestris, but that was years ago, at last they are flowering - hooray !! Glad to have found your blog, will be visiting again !